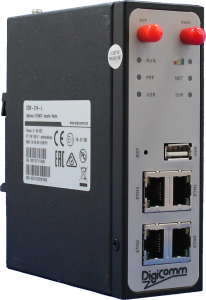 Inaccessible or mobile outstations that do not have access to the telephone network or ADSL can be integrated into central networks using the DSR-214-L LTE / UMTS router. In this which is available worldwide. Theoretical speeds of up to 100Mbit/s in the downlink and 50Mbit/s in the uplink are possible via LTE. The DSR-214-L is used for monitoring water, gas and electricity networks as well as for securely transmitting data for POS terminals and ATMs, video and media transmission (digital signals) and the remote maintenance of vending machines and other industrial machines, plants and equipment.